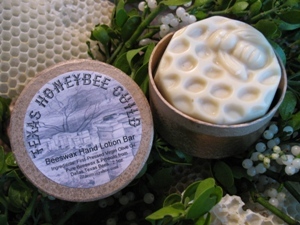 This is one of my favorite products, Beeswax Hand Lotion Bar, the only hand lotion I use and a terrific gift idea. There's no greasy feel or pushy fragrance and it's really good for your skin. Also with less than 10 days to Christmas, let me give you some of my favorite natural gift suggestions. For the Gardener: A basket filled with organic products like my gardening books, seeds, orange oil, Garrett Juice, and compost tea. A basket of garden tools is also a good idea. Items can include Pallina garden gloves, interesting trowels, Water Right hoses, hand pruners, and interesting plant labels so you can remember the names of the plants you bought. Gifts for the cook: bamboo cutting boards and other bamboo products, cookware, reusable water bottles or a whistling tea kettle. Bath and Body: soap or organic sheets. Babies and children: Start the little ones off right with natural, organic fiber clothing and all the latest accessories. Bring children’s imagination to life with safe, non-toxic toys. Another great and easy holiday gift is a subscription membership to the Dirt Doctor website.